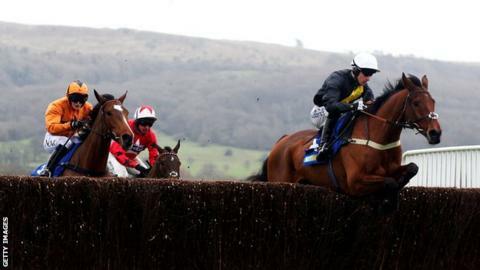 Seeyouatmidnight won the BetBright Novices' Chase in front of more than 34,000 people at Cheltenham. The 7-2 winner led from the outset and finished three-and-a-quarter lengths ahead of Blaklion in second. It was the first of two victories for trainer Sandy Thomson's team, after Wakhan came in at Musselburgh. "He was probably getting a bit lonely in front, but it's a fair performance on his third run over fences," jockey Brian Hughes said. Seeyouatmidnight came in third on his chasing debut at Carlisle in November, but went on to win at Kelso on 6 December to earn a step up to a Grade Two level race. Thomson added: "We're so lucky to have him. He's an absolute star. "He just does everything you ask of him and he's jumped brilliantly today." "The foot-perfect success of Seeyouatmidnight not only booked the eight year old a trip south to the Cheltenham Festival - probably to the RSA Chase - but was a notable result for jump-racing in the north of England and Scotland. "The word 'beleaguered' is regularly used about national hunt's northern circuit, and a recent report highlighted a north-south divide as regards quality of horse and rewards. "So for a Scottish horse to take southern scalps so soon after Yorkshire-trained Wakanda won at Ascot is a significant boost."